The runway was on the short side, only 5000 ft. Two-thirds of it was concrete and one third PSP (Pierced Steel Planking). The ramps and taxiways were all PSP. This article is the first in a series of articles, called the Korea Files, from retired USAF fighter pilot and Korean war veteran, Captain Bill Todd. I arrived in South Korea in July 1951, after having spent a month and a half at Johnson Air Force Base outside Tokyo. My first duty station in Korea was Suwon Air Force Base, or K-13, located several miles southwest of the ancient walled city of Suwon. The air bases were all identified with “K” (for Korea) numbers. The further south you went the lower the numbers. K-13 was the main base of the 4th Fighter Group, which was comprised of three squadrons: the 334th, 335th, and 336th. Each squadron had a complement of 25 North American F-86 Sabre (F-86A) aircraft. The total number of qualified pilots assigned to the three squadrons and group personnel was approximately 120. Living quarters at K-13 were quite basic; we lived in tents very similar to the ones shown in the television program M*A*S*H. They had wooden floors and sides about three feet high, with a very large canvas tent that provided adequate cover from the heat and insects. There were eight men assigned to each tent. Our beds were standard Army canvas cots, enclosed in a mosquito net, which was quite literally a life saver. There was no running water, so our “sink” was a metal combat helmet turned upside-down on a plywood table. There was no refrigeration except at the Mess Halls, so consequently no ice. The first order of business to make life at K-13 more livable was to pull loose some of the floorboards and dig a hole. In this hole, you put your beer. This kept it a few degrees cooler than if stored in the tent. Each tent was assigned a Korean houseboy. They kept the tents clean and did our laundry. Although they were only 12-14 years old, they were usually providing the only income in their families. On the whole, they were very nice and intelligent youngsters. Several 14-year olds from Suwon were already studying calculus. The lavatory facilities were truly bare bones. Toilets consisted of an outhouse with a plywood bench. Several holes were cut in the bench, and under each was a 55-gallon drum with the top removed. Needless to say, one did not do any reading in that facility. It’s truly amazing how long you can learn to hold your breath in situations like that. Periodically, the South Korean farmers would come and replace the used drums with empty ones, using the waste as fertilizer on their fields. Without running water, we lived out of our canteens. These were filled from a large canvas water bag, laced with “Holozin,” which killed the bacteria. It’s a taste you can never get used to. Our weekly shower took place in another tent with overhead shower heads. They turned on the water, which was sometimes warm, and once we were wet it was shut off. We would quickly lather up, and wait for the last short burst of water to rinse clean. Of course, the entire base was built on dirt with the exception of the airfield ramps, taxiways, and runway. Dust is something you get used to. Our mess hall was the one bright living condition. We were served by South Korean houseboys, and the food was excellent. The rumor floating around K-13 was that the mess cook had been a chef in New York City. We were on what they called Field Rations. This meant all your needs were provided. There was a table in the Mess Hall about 15 feet long that had all the necessary sundries: shaving gear, toiletries, soaps, candies, cigarettes, etc., anything that you would ever need, provided for free. I eventually quit drawing my pay and let it build up because we had no real need for money. I forgot about my car payment back in the States, but luckily my dad covered for me before they repossessed it. The Officer’s Club was a double tent complex with a few tables and a very rough wood plank bar. There was normally no ice, so all drinks were room temperature. The only consoling factor was that beer was only 5 cents, and liquor was 10 cents. Even at those prices, warm beverages seemed to hold down the consumption. On rare occasions, someone would go the nearby Army base, which had a grave reclamation unit. They had ice machines to keep the corpses cold, so when someone went there they brought ice back to our base and we enjoyed cold drinks. Outside each tent was a slit trench about four feet deep, two feet wide and about 12 feet long. This is where we sought refuge when “Bedcheck Charlie” came. Bedcheck Charlie was a small North Korean single-propeller airplane that would periodically visit us in the early morning hours, dropping mortar shells. He did very little damage, so it was more of a sleep annoyance than anything else. Because the aircraft was so small, the radar was couldn’t pick him up, so our anti-aircraft batteries were not successful. It did make for some nice night-time fireworks displays! K-13 had been overrun by both the North Koreans and United Nations Forces and suffered the resultant damage. The runway was on the short side, only 5000 ft. Two-thirds of it was concrete and one third PSP (Pierced Steel Planking). The ramps and taxiways were all PSP. On takeoff and landing the PSP would roll up slightly in front of your landing gear. This helped slow you down on landing, but it was detrimental on takeoff. Our base had a perimeter fence with around-the-clock armed guards. Although infiltrators were not a real threat this far south of the front line, keeping starving children off base was. They knew if they could get on base that we would feed them. They were not a pretty sight. Korea had been so devastated by war that there was not much to see or do in the city of Suwon. I visited only once. The only thing in town worth visiting was the central marketplace with their open stalls. 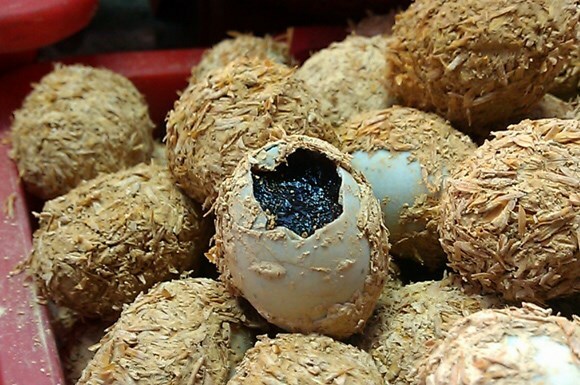 The presentation of their food and such was rather overpowering, such as the “Thousand-Year Eggs” encased in mud and fermented along with dried fish and fowl. Needless to say, we did not try any of the food there. The 4th Fighter Group was moved from K-13 to K-14, for two reasons: the runway was so rough because of filled-in bomb craters that the F-80s using that runway were having their bombs shake off during takeoff, and K-14 was 20 miles further north than K-13, which would give us more air time flying over North Korea. K-14 turned out to be an improvement over K-13. Kimpo Air Force Base (now known as Gimpo) was the major airport for Seoul, in the nearby town of Kimpo. True, the runway was rough, to begin with, but it was gradually improved over time. It was also longer than the one at K-13, at 8,000 feet, and all concrete, with the exception of some ramps and taxiways, which were PSP. In the summer they were fine, but they were something else in the winter. During winter, a thin sheet of ice would form on top of the PSP, which might cause you to slip and slide as you taxied to the runway. In the winter our most prized possession was the oil-fired pot belly stove. This we kept going 24 hours a day for warmth, and it would actually turn red-hot, but it somehow stayed together. When the North Siberian wind blows in across the Yellow Sea, South Korea can become a very cold place. K-14 was only 12 miles south of the Han River, which was the dividing line between North Korea and UN Forces, so we not only had Bedcheck Charlie pay us his periodic visit, we now had sporadic nighttime small-arms fire from out in the countryside to keep us on our toes. My uncle was a fighter pilot in the 8th FBG, which had moved to K-13 after the 4th FIG went to K-14. The latrines were the same, and slit trenches were still there. But the tents had been replaced with Qounset huts for the pilots, bigger buildings for the Officers Clob, dining facilities, etc. When my uncle arrived at K-13 in late February 1953, his group was transitioning from the F-80C to the F-86F Sabre.